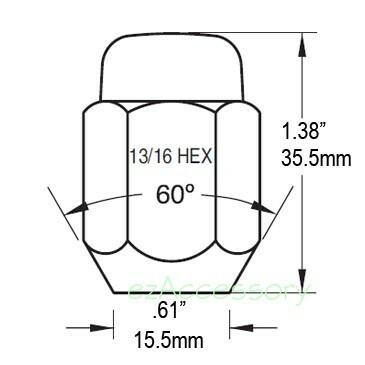 Acorn style 12mm x 1.25 threads lug nut. 13/16" hex. Chrome finish. Fit most Nissan, Subaru, Suzuki, Datsun, Infiniti cars and trucks. Please refer to the following drawing for exact specification and size. Visit our application guide page for fitment information. Price is for each piece.